I've avoided opining about sports-related subjects here because, much like politics, saying the wrong words or professing incorrect allegiances can alienate a wide segment of your audience. However, recent news is so huge that it transcends that athletic world and touches upon economics, popular culture and quite possibly a upcoming political event. A little background information is in order before I go on. I lost my "fanatic" standing many years ago when serving at overseas military locations in the early and mid-1980s. In the days before commercially feasible satellite television service, armed forces television audiences were at the mercy of videotaped offerings shipped in from stateside locations or tape-delayed at dispersed ground stations. At many Far East bases, the Monday Night Football program was telecast on Tuesday evenings and since the radio service had no such technical challenges with live events, you would already know the outcome. This was an improvement over not having any radio or television service and relying upon the delivery of the Stars and Stripes newspaper and its days-old results and standings to keep up on down-to-the-wire pennant chases. Due to military travel commitments, I missed two Super Bowls in the 1990s (XVII & XXIX) so even that unofficial American "holiday" no longer has a choke hold on me. In fact, I find fantasy football to be much more entertaining than some of the regular season NFL matchups seen in my local media market (Cincinnati Bengals and Cleveland Browns). I knew that the announcement was pending but I wasn't actively following the James story. It was my phone's constant chiming right around lunchtime that told me something important was going on and I thought that I could literally feel the collective positive energy that started emanating from 178 miles away (two events actually--more about this "flurry" later). 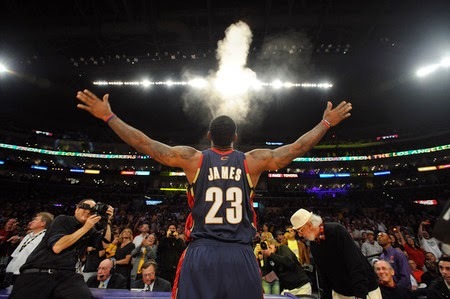 When I later checked my Facebook and Twitter accounts, they seemed to have gone into overdrive with "King James" this and "King James" that (LeBron was given that royal moniker early in his basketball career so there was a lot of connections to the concept of him "abdicating" Cleveland back in 2010--there is even more vivid imagery and allegory used by a variety of commentators to properly frame his return that I share later in this piece). ESPN, the 24-hour cable sports news network, provided nearly wall-to-wall coverage of anything having something to do with this move (other options for free agents, Las Vegas odds, etc.) 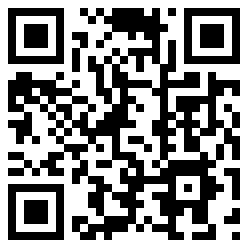 for the remainder of the weekend with perhaps only the World Cup championship match getting slightly more attention. 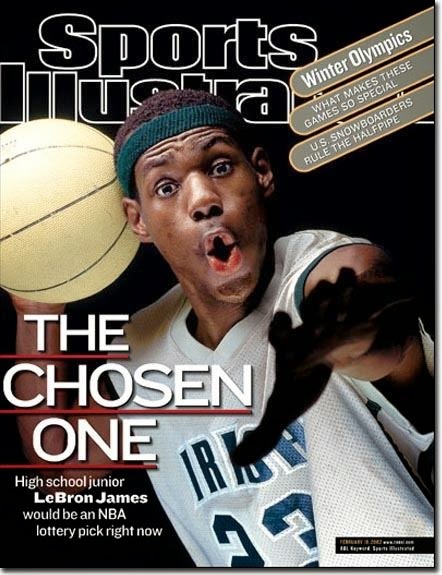 Coverage of James' ascendancy to becoming the best player in the NBA started when LeBron was still in high school, above appearing on a February 2002 cover of Sports Illustrated. I first became aware of LeBron James back in the 2002-2003 timeframe when the then-high school phenom was featured on the cover of Sports Illustrated and his St. Vincent-St. Mary's team getting airtime on ESPN2 and national-level exposure at various tournaments (I was more intrigued about his turf tape "camouflaging" to comply with the school's no-visible-tattoo policy than his on-court skills when I watched). He jumped immediately to the NBA after graduation where was selected as the top overall choice by his "hometown" team, the Cleveland Cavaliers, and earned Rookie of the Year honors. Although the perennial cellar dweller missed the playoff during his first two professional seasons, 2006 was a breakout year for both James and the franchise and it started a streak of five straight post-season appearances for him in a Cavalier uniform. The 2007 season was the high-water mark for the team when they won the league's Eastern Conference title and a match-up with the San Antonio Spurs for the NBA championship (they were swept 4 games to none). Two more playoff seasons followed but it was after a disappointing 4-to-2 series loss to the Boston Celtics during the 2010 conference semi-finals that the whispers of "the Cleveland Curse" that routinely swirled around that city would erupt into full-throat screams of agony and effigy burnings. After that 2010 season, James became a free agent and was allowed to sign with any team in the league. Many expected the Akron-native to stay put in Ohio to bring home the long-awaited championship but others were plotting to bring him to a much warmer waterside location. Billed as "The Decision", James was given 75 minutes of ESPN airtime on July 8th to announce to host Jim Gray and an international television audience where he would play the following season. Near the 30 minute point, he made one city giddy and another apoplectic when he said he would take his "talents to Florida's South Beach community and join the Miami Heat". Spontaneous anger erupted across "The Forest City" with fans branding James a traitor and burning their replica jerseys on the city streets. Team owner Dan Gilbert issued a scathing statement accusing his now-former franchise player of "cowardly betrayal" and made a hasty "bankable" guarantee to the team's fans that the Cavaliers would win an NBA championship before James won his first. 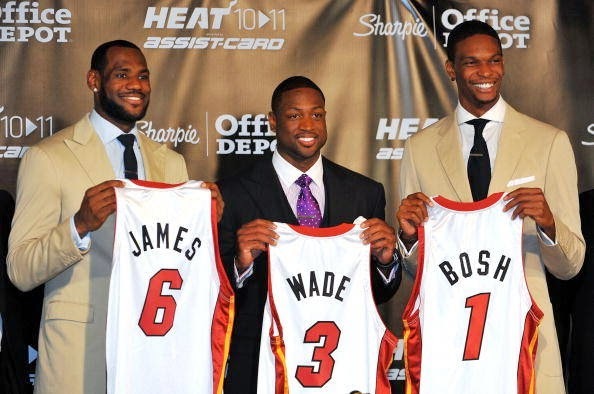 LeBron James, left, Dwayne Wade, center, and Chris Bosh, right, show off their Miami Heat jerseys at a team welcoming event in July 2010. Miami's main advantage over Cleveland was the Heat's signing of fellow free agents--and All Stars-- Chris Bosh and Dwyane Wade in early July. With James' decision, the team now had a "Big 3" nucleus in order to build a championship-caliber team. The Heat advanced to the NBA finals in their first year of the James/Wade/Bosh lineup but were defeated by the Dallas Mavericks 4 games to 2 despite having a 2-1 series lead (James' scoring drop-off in that series--most noticeably in the fourth quarters--was blamed for that reversal of fortunes). Fueled by that disappointment, James worked with former NBA legend Hakeem Olajuwon to improve his post play and the Heat marched through the regular season and playoffs to another finals appearance, this time a match-up with the Oklahoma City Thunder. Although they dropped the first game, the team came roaring back with four straight wins to claim the franchise's second NBA championship (and James' first--he was also named the Finals MVP. The 2013 season saw them repeat as champions, winning a grueling 7-game series against the Spurs and they would face off again in this past season's finals, although San Antonio would exact their revenge in a 4 games to 1 thumping against a Heat squad that was beginning to reflect the advancing ages of their "Big 3" stars (Wade turned 32 in January and both James and Bosh will turn 30 by the end of this year). 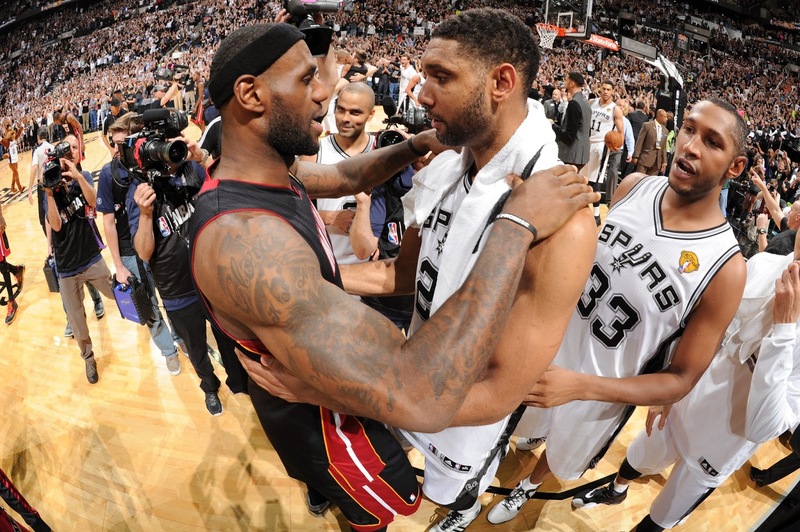 It was perhaps the stinging nature of how that Spurs series played out (and the failure to accomplish the rare "three-peat" of championships) that had basketball experts thinking that James might test the free agency waters again and move to another organization--perhaps even his old team (he did sign a 6-year/$109.84 million contract with Miami but it also allowed him to opt out of the final two seasons). On June 25th, just 10 days after that series loss, he announced he would exercise that option and become an unrestricted free agent effective July 1st. Many thought that this was merely a ploy to get more money out of his then-current club. James did take a $1 million pay cut from his final Cleveland salary to join the Heat in 2010 but it elevated to over $19 million per season in his final year in South Beach. Due to his multiple regular season and finals MVP awards with Miami, he was expected to become the team's top-paid player for the 2014-15 season (he and Bosh were being paid identical amounts for their four years together--Wade came in a few hundred thousand less than their totals). The Heat and the Cavaliers, according to inside sources, were the only two serious contenders and Friday's "Decision 2"--this time done via social media and the internet instead of a television special--provided the answer to this all-important question and unleashed the rest of the league's free agents who could now negotiate for their own big paydays knowing where James would be playing next season. I will admit, for the sake of full disclosure, that I am a long-time Spurs fan and I relished in their recent "dismantling" of the "Big 3" after seeing how they handed over the title to them the previous year due to poor defensive stands in the final two games. 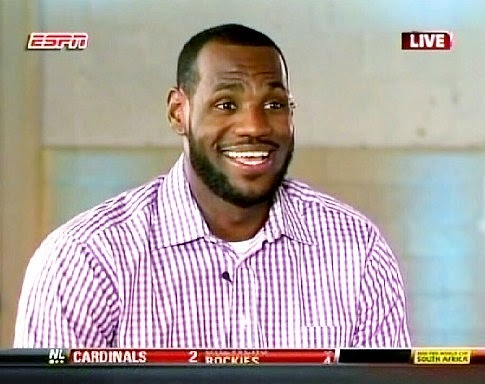 Despite this predisposition, I must admit that there isn't too much not to like about LeBron James. Being billed as being perhaps the greatest basketball player ever or, at the very least, "the next Michael Jordan" even before playing a single professional game could inflate one's sense of self-importance and create an unrealistic goal a late teen or early 20-something man just can't handle (one of those many protégés, Len Bias, died of a cocaine overdose two days after being selected by the Boston Celtics with the second overall pick of the 1986 NBA draft). While there were some slight "bumps" in the early stages (admitted marijuana use and car/replica jersey controversies while in high school), James has become one of the most influential--and "bankable" in terms of endorsements-- personalities in all of pro sports. He represented his country at three separate Summer Olympics and, in the wake of the disappointing bronze medal result in Athens, took on a greater leadership role for Team USA's gold medal wins in both Beijing and London (and, barring injury, a probable third in Rio de Janeiro in 2016). He married his high school sweetheart and they have raised two sons together. On several occasions, he has shared his personal religious beliefs in public settings and is an active philanthropist. Despite the physical toll he inflicts on his body, he plays "clean" (no connections to performance enhancement drugs) and his Hollywood-esque looks have landed him a multitude of endorsements as well as appearances on television shows (and one somewhat controversial Vogue magazine cover from 2008). His only "sin", at least to Clevelanders, is his being a New York Yankee fan (and being seen at city baseball games wearing that team's cap). Although Cavaliers fans had to endure some very lean years in the wake of James' departure (the team won 61 games during the 2009-2010 season but only had 97 total victories in the four seasons without him), there were some "silver linings" to brighten the franchise's future. 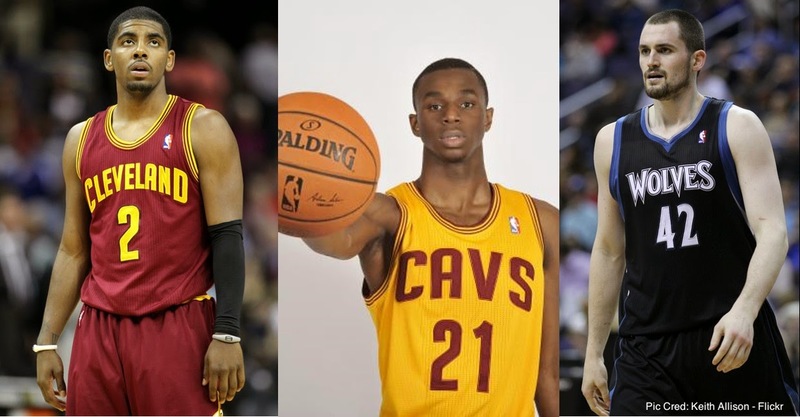 Picking up point guard Kyrie Irving and small forward Andrew Wiggins with the first overall draft picks in 2011 and 2014 draft lotteries (or trading Wiggins to the Minnesota Timberwolves for power forward/center Kevin Love), James will have Wade- and Bosh-like components to potentially create a new "Big 3" along the coast of Lake Erie. Throwing in the hiring of head coach David Blatt and the potential addition of a seasoned free-agent or two to help shoulder some of the load James will be expected to carry when the 2014-2015 season starts (early Las Vegas odds show the Cavaliers a 7-to-2 favorite to win the league title over the team that just beat him and his former squad). 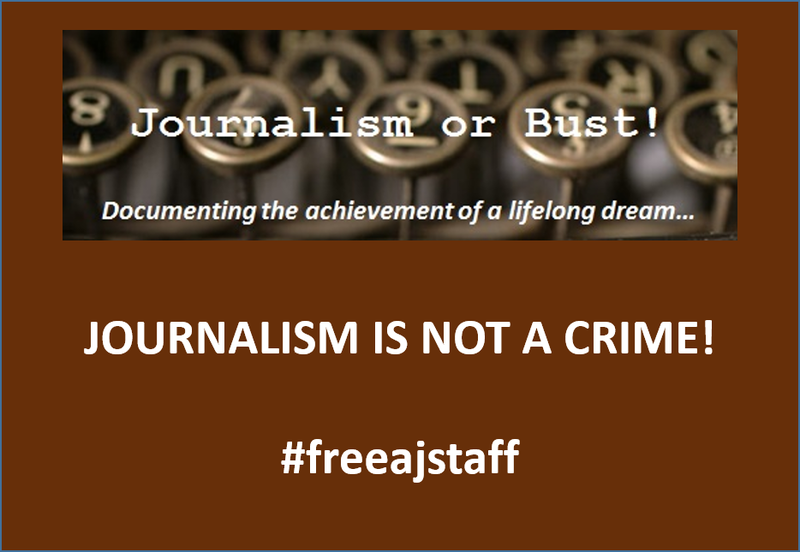 As I said in the beginning, I have not written a sports piece before now and I'm only doing it because the story is so big that it transcends that world and touches upon other normally non-contiguous topics. One of those happens to be statewide (and possibly national) politics if the Cavaliers do make it to the NBA Finals in two years' time. Back when James made his announcement to move to Florida, then-governor Ted Strickland joined an organized effort to try and convince the native Ohioan to remain in Cleveland while his opponent (and current governor) John Kasich could not be bothered, instead expressing his desire to focus on the 400,000 jobless workers during a competitive fall general election. 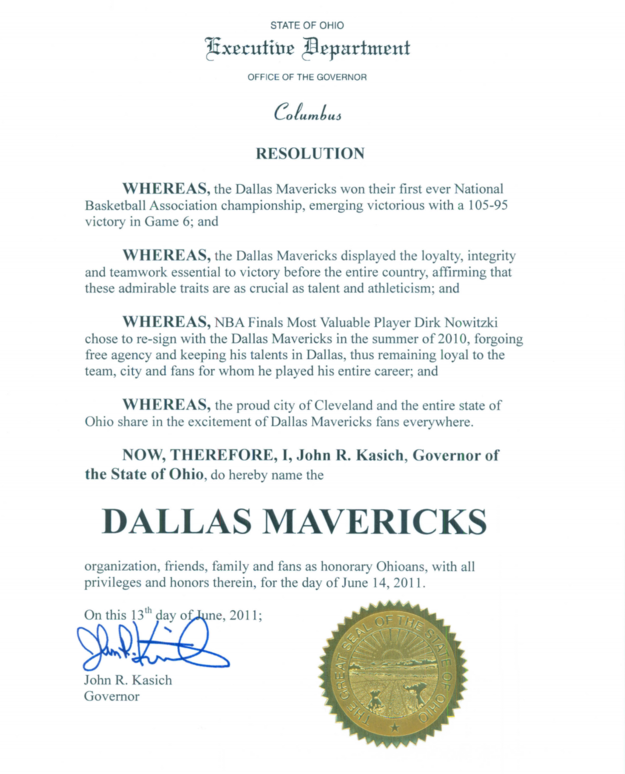 When the Dallas Mavericks defeated the Heat during James' first season with that club, he issued an obvious anti-LeBron proclamation making that "organization, friends, family and fans" honorary Ohioans (with several intentional "digs" on James and his actions in the introductory paragraphs). 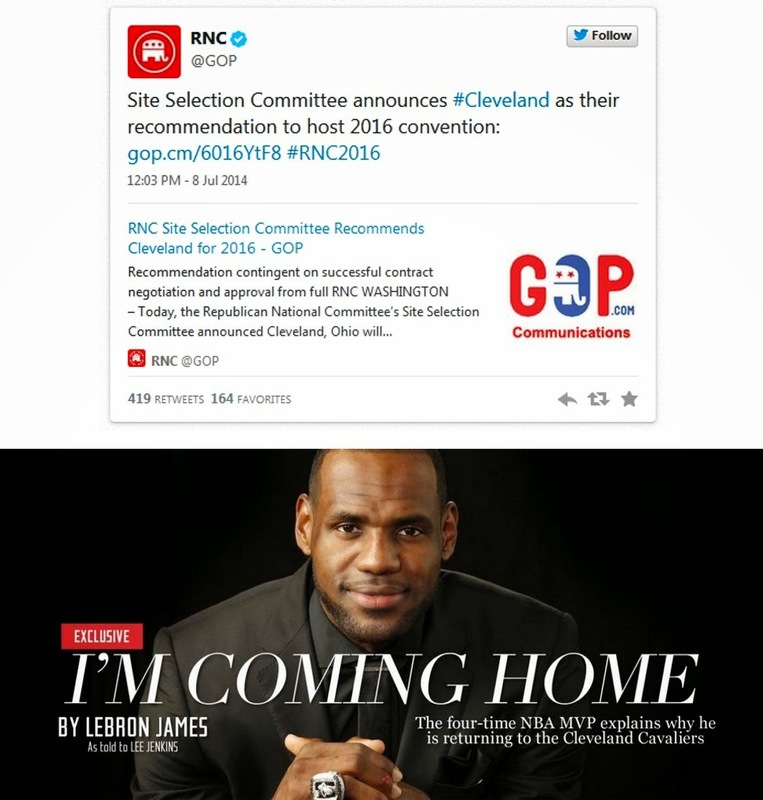 To commemorate the Cavaliers' resigning their former player, Kasich had a similar awkward PR move via Twitter when he gave James second billing ("Ohioans created another job") to the recent announcement that the Republican National Committee picked Cleveland as the site for their 2016 national convention, the state's first hosting duties for any major party convention since the Democrats' gathering in that city back in 1936. LeBron could get the last laugh, however, if his team secures the best regular season record and makes the finals that year. The latest date an NBA Finals game has been played was June 23rd, 2005 during the contested series between the Detroit Pistons and the San Antonio Spurs. If each round of the playoffs in 2016 has at least one series go the full seven games, then we could have a venue conflict (or reduce the time the RNC would have to get the Quicken Loan Arena set up for their activities). By one account, the Republicans picked Cleveland over Dallas because the Texas city could not guarantee them the American Airlines Arena in late June due to the playoff success histories by their professional basketball and hockey teams during extended playoff seasons. In another social media "fail", the RNC made their announcement around 11:30AM on July 8th. 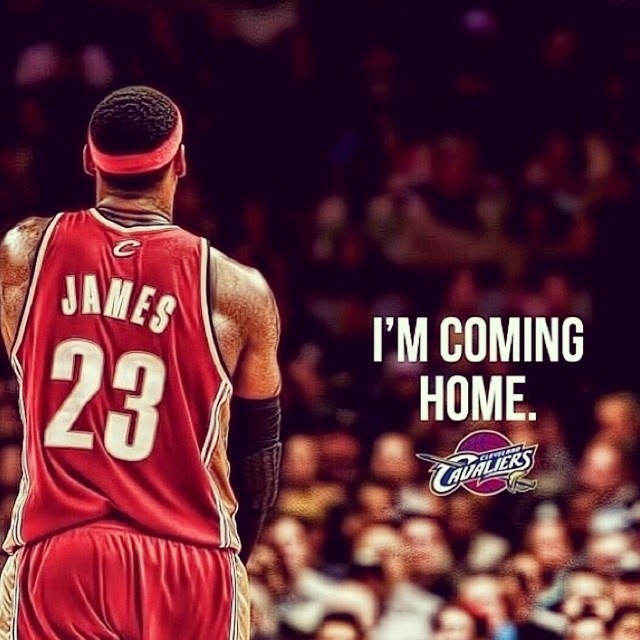 Although it was received with great enthusiasm by Clevelanders, that news was completely blow out of the water with the James' announcement coming about an hour later on that same day. In an exclusive, Sports Illustrated published LeBron's rationale for returning to his former team in a tone more somber and gritty than his exuberant multiple championship "guarantee" made sitting alongside both Wade and Bosh when they were introduced to the Miami fans and media back in 2010. 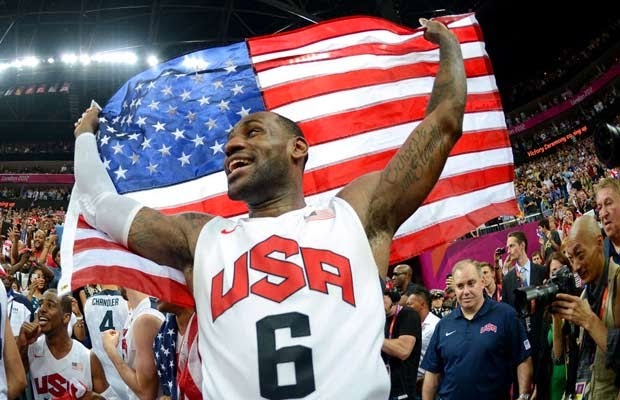 While Cleveland's sports world is rejoicing about the return of "King James" (along with the Browns' selection of Heisman Trophy winning quarterback Johnny Manziel in the recent NFL draft), it's the city's economic sector that is expected to really appreciate him coming back to town. Dubbed a "LeBronomy" in a news segment aired on the city's ABC television affiliate, the value of him rejoining the Cavaliers to the northern Ohio economy is estimated at up to $53 million per year. Current Cuyahoga County Executive (and Democratic gubernatorial candidate Ed Fitzgerald) combined politics and economics in a recent press conference, complete with graphs demonstrating the definitive impact "Decision 2" will have in the way of money, jobs and visitors to the region. Combine that with the anticipated revenues generated by the 2016 RNC convention (the Tampa Bay area saw a net impact of $427 million for hosting their 2012 political gathering) and one can readily see that things in Cleveland are definitely looking better than they did at the beginning of this month. 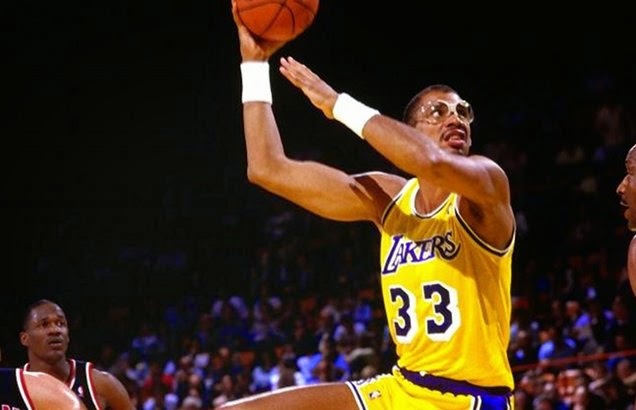 In a magazine piece, NBA all-time scoring leader Kareem Abdul Jabbar compares James to a "straying husband" with his recent decision to return to Cleveland. One of the advantages/disadvantages of not being on a "deadline" when writing my pieces is that I get a chance to reflect on what everyone else is saying before I put my thoughts to keyboard. While most of the press surrounding James' return are positive, one item by a respected basketball authority attracted my attention. In a Time Magazine article, NBA all-time scoring leader Kareem Abdul Jabbar borrows the title of a well-known Thomas Wolfe work (the 1940 novel You Can't Go Home Again) to help him articulate why LeBron cannot return to the place he originally left in 2010. Saying that some fans equate his move to Miami is equivalent to that of a "straying husband" leaving their long-time spouse for the "younger, hotter, firmer slice" offered by the Heat, he used his own career desires--and his move to Los Angeles from Milwaukee--to try to put the current player's motives in perspective. He blames emotions for the initial departure ("he celebrated the move as if it were the exodus from Egypt and enslavement") and an acknowledgement of his immaturity for his return ("he’s coming home with a bouquet of roses in one hand and a diamond bracelet in the other, begging forgiveness for his foolish mistake of lustful youth"). While he thinks this move is good for basketball, he ponders if Cleveland fans will simply wait for him to hurt them again (he only signed a 2-year, $42 million contract, although it is believed he will continue on with the club after the league's collective bargaining agreement comes up for renewal in 2017 and it signs a new television contract that will increase the league's overall revenue ceiling in 2016). Conversely, there is also a camp that believes that this was the only logical move that James could make. Jim Sollisch, an associate partner at MarcusThomas LLC, a Cleveland ad agency, opines that he returned in order to become a "legend". Like Jabbar, Sollisch borrows from past literature--Greek mythology--to explain his rationale (the "quest and return" theme seen in tales by Homer and others). 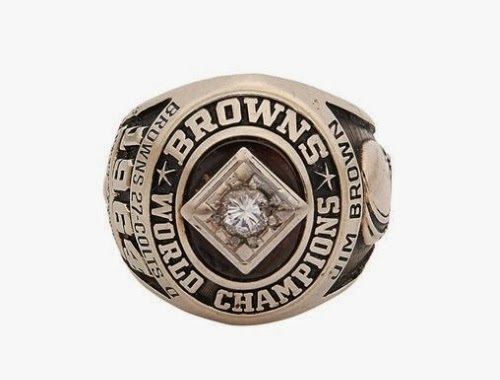 After such easy success in Miami (four NBA Finals appearances, two NBA championships, two Finals MVP selections, and two league MVP selections in that 4-year span), he needed to come back to his original team to achieve similar levels of success in a town that has not had a major sports championship in half a century (the 1964 Browns won the NFL championship in its pre-Super Bowl days and a photo of Jim Brown's ring is provided above). With the promise of Manziel for the football team and the now championship-resumed reality of James for basketball, perhaps that five decade "drought" might soon be over. What is my own take on this (I couldn't escape by just linking/mentioning other people's thoughts now, could I)? As a non-fanatic sports follower, I am someone who always tries to root for the underdog (unless they are playing one of my favorites) because it adds to the variety of the sport. 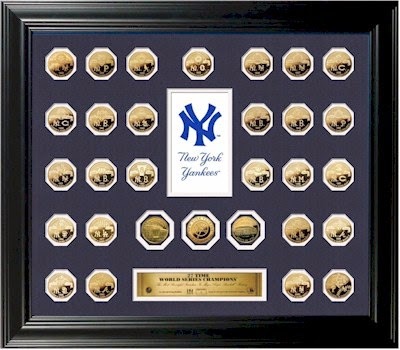 In baseball, the New York Yankees have won 27 of the 40 World Series championship series they advanced to in their 113-year history (for you math "geeks", that's getting to the series every 2.7 seasons and winning a championship every four, giving them a .675 winning percentage when they got to those final match-ups). They have 16 more World Series titles than the runner-up team (the St. Louis Cardinals) and one less than the total for them added to the those won by the third- and fourth-place teams (the Oakland Athletics and Boston Red Sox, respectively). The Yankees have been so good for so long that 17 numbers have been retired. To me, too much success can have a negative effect and take away the "love 'em, hate 'em" relationship fans have with clubs with more infrequent success. There are similarly successful teams in other major North American sports leagues (the Montreal Canadians have won 24 Stanley Cups in hockey, the Boston Celtics earning 17 NBA championships and the Green Bay Packers claiming 8 NFL league titles and 4 Super Bowl trophies) and each attracts a fair amount of non-local fans based solely for their propensity for winning. Contrast that to supporters of the Chicago Cubs baseball team, a franchise that has not won a World Series title since back-to-back wins in the 1907 and 1908 seasons and has failed to appear in "the Fall Classic" since 1945. Nicknamed by some followers as "the Loveable Losers", their current 105-year streak (which, after looking at their recent record, will undoubtedly stretch to 106) dwarfs that of the next longest in baseball (the Cleveland Indians are 65 seasons removed from their 1948 championship victory) as well as the NFL (the Detroit Lions at 56 seasons), the NHL (the Toronto Maple Leafs at 46 seasons) and the NBA (neither the Atlanta Hawks and the Los Angeles Clippers have made it to the championship series in their 44-year existences). 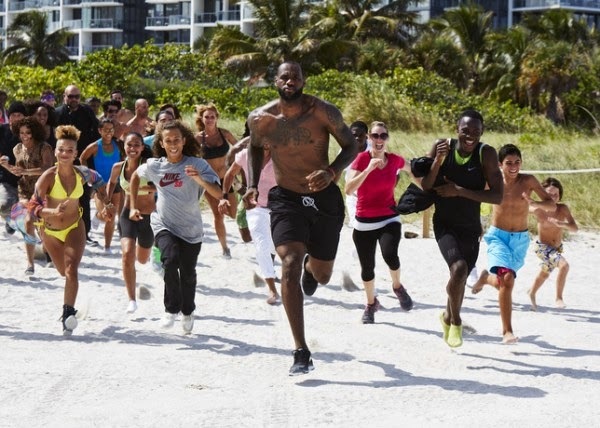 LeBron James shows off parts of his grueling training regimen during a 2013 Nike commercial. So what does this have to do with LeBron? Now knowing what it feels like to win it all, James can attempt to replicate that phenomenon with a club--and a city--that is hungry for a title. He left Cleveland back in 2010 to make himself a better player, both physically and emotionally (although he was vilified by many for pursuing that goal). He had taken the franchise to the brink of a title in 2007 (against my Spurs) but that may have been too much too soon as witnessed by their manic regular season finishes (ranging between 45 and 66 wins) and predictable post-season swoons over the next three seasons. Not even the addition of perennial all stars Ben Wallace and Antawn Jamison and future Hall of Famer--but well past his prime--Shaquille O'Neal could get LeBron back to the championship round to avenge getting swept in his only appearance up to that point. 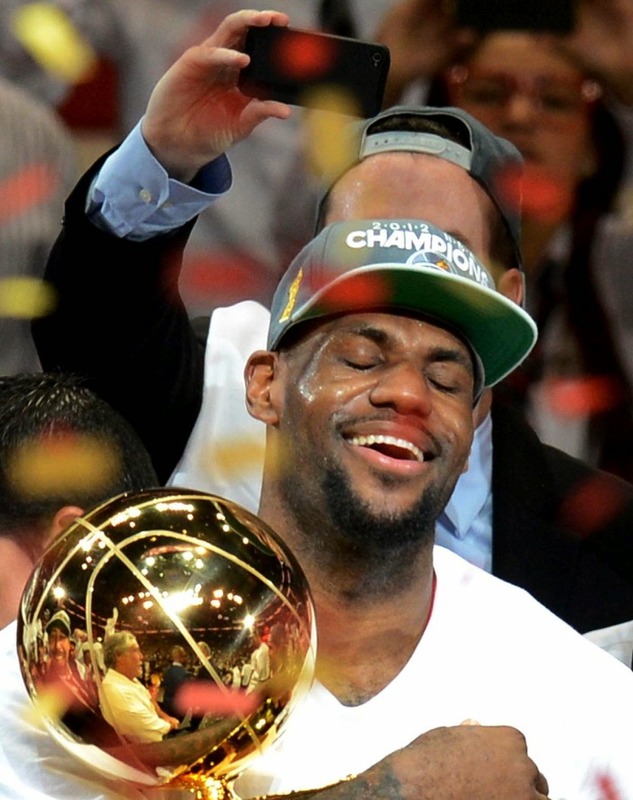 In fact, it wasn't until his third attempt at hoisting championship hardware did success come his way (the 2012 victory over the Thunder) and you could tell by his unchoreographed reactions to that acclaim and level of recognition that a huge burden was finally lifted off of his shoulders. Winning a consecutive title the following year (and getting to the finals the season after that) ingrained this ethos into his already hard-working character. Four years removed from burning his jersey in disgust, his "transgression" has been forgiven by a majority of his previous fans (as well as a two-way apology with the team owner) and this season should be one to watch--and perhaps cherish. And what is good for Cleveland is, by association, good for Ohio and the state really needs all the support it can get (selecting Columbus for the 2016 Democratic convention would be nice). Armed with that rationale, I will be rooting for him to again attain the championship heights he reached in Miami--that is unless he faces San Antonio for a fourth time in the NBA Finals. Hey...a state allegiance can only go so far.